We visited the SeaLife Centre at Trafford Centre back in December with friends of ours to celebrate our girls’ birthdays. The two girls were born just a few days apart, so we decided that instead of exchanging birthday and Christmas gifts that we would give them an ‘experience.’ We chose SeaLife Centre because we thought it would be a nice change of pace from the usual soft play gyms. It turned out that it was a great choice. Upon entering the SeaLife Centre, you watch a short presentation about sea turtles and their life cycle. I only heard bits and pieces of it as the girls were antsy after being in the car for 40ish minutes. After the presentation finished, we were free to enter the aquarium. The girls were really taken by the first display which was a jellyfish tank where they could actually change the colors of the lights in the tank. I honestly did not think we would see the rest of the centre because they loved choosing the next color to turn the jellyfish! Some of the other highlights were the tunnel under one of the tanks that the girls could walk through, touching a starfish, spotting the resident sea turtle and some sharks, and the soft play area (of course!). We went on a weekday during term time, so it was not busy at all. SeaLife Centre is not overly big, which made it just the right size for two 2-year olds to walk around. It was only near the end that my girl asked me to carry her for a little bit. We really enjoyed our day, and I would happily go back as I think our girl would be even more mesmerized by the “fishes” now. It was a fun day out to celebrate our girls! 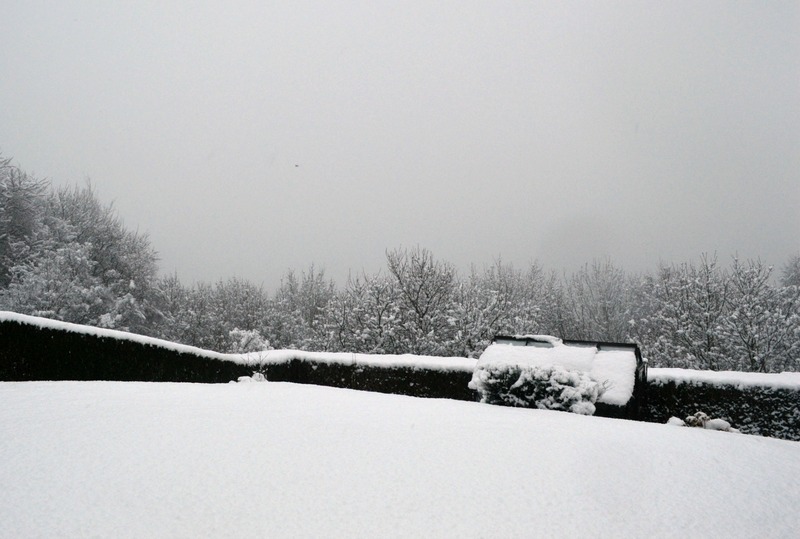 Lucky for me though, we decided to do an overnight visit to the Lake District over the Christmas break. We booked into the Macdonald Old England Hotel & Spa on Lake Windermere for the night of our anniversary. In the month or so leading up to our stay, there was a lot of flooding in the Lake District. It was devastating for the area. I half wondered if the flooding was going to reoccur because of the incredible amount of rain we had around Christmas and Boxing Day, but the weather report for the 29th of December was clear so we headed north on the day. 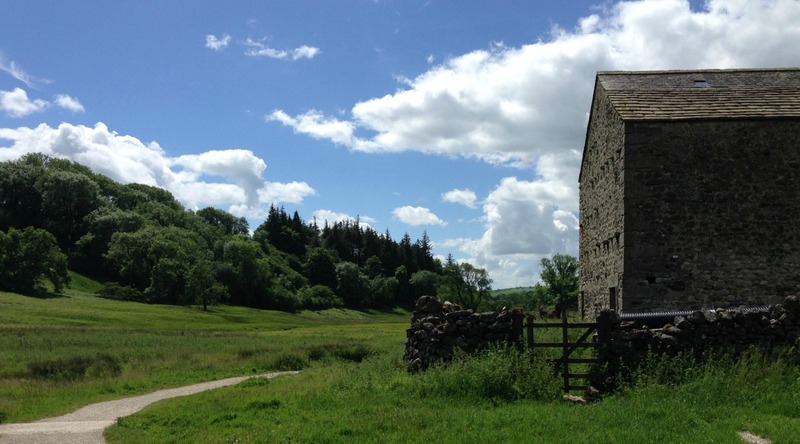 Funnily enough, my former boss and mentor from college was returning from the Lakes as we were heading there, so we met her, her husband, and two of their friends at Low Sizergh Barn, a farm shop and tea room not far from Lake Windermere. It was so great to see them again and to have them finally meet Richard! 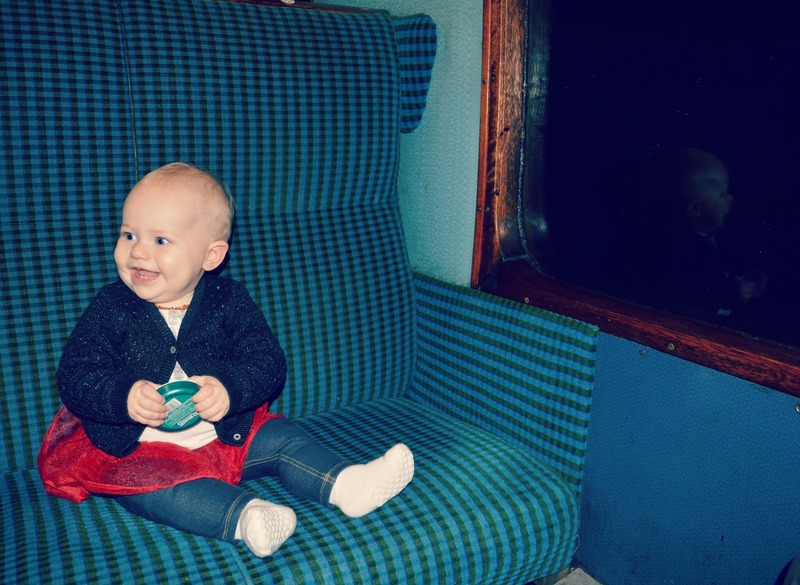 (The girl and I took the train to Liverpool in July 2014 during one of their visits to see family, so they loved seeing how much our girl had grown since then.) It always makes me happy when my life in the US collides with my life in the UK, and this meet up was wonderful. It didn’t hurt that we had a lovely lunch to go with the conversation. I only wish we had more time with them – next time! We parted with lots of hugs and ‘see you soons’ and continued on our way for another 20 minutes until we reached the town of Bowness-on-Windermere. As we drove in, we could not get over just how many tourists there were in the town. The temperature was mild yet getting colder and there was no sun to be seen, but the town was certainly bustling. After we checked into the hotel, we put our girl in the backpack and ventured out for a walk. We walked along the lake for a bit and then turned back to head into the town for a little nosey in the shops. I love towns and villages like Bowness with their narrow streets and range of shops. 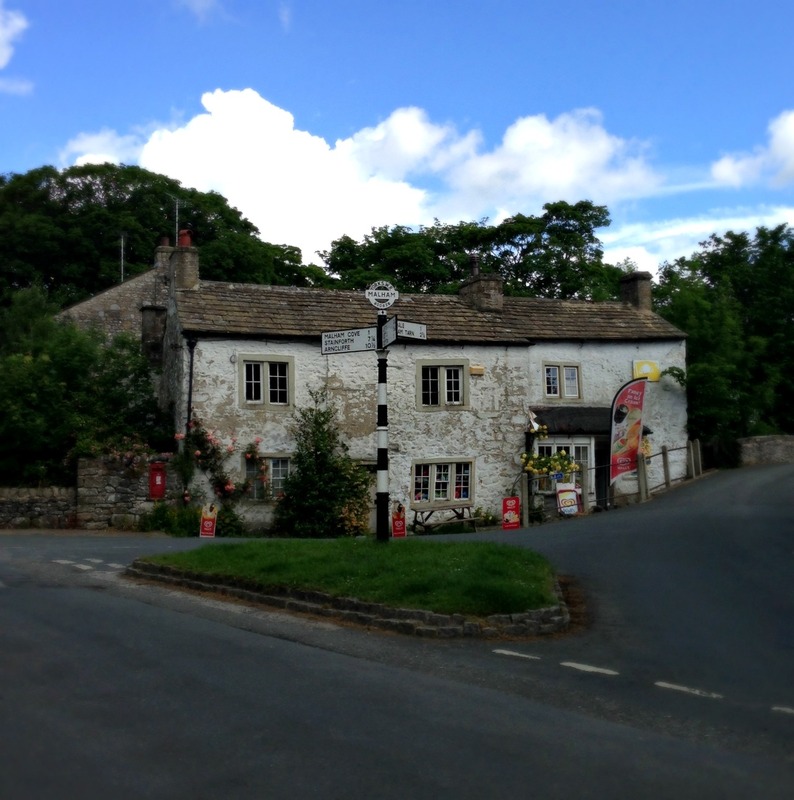 There were a few Beatrix Potter-themed places (as she penned her stories in the area), independent shops, chain stores like Joules and Fat Face as well as a mix of restaurants and cafes. We enjoyed our wander, even treating ourselves with a few items from the after Christmas sales. The regular menu had some excellent options for us and the children’s menu had macaroni and cheese, which made our sweet girl happy. Our food was delicious. All three of us thoroughly enjoyed our food choices. However, the service was lacking. I was really disappointed to see a place with so much staff seem to forget that we even existed. Our starters came within a reasonable amount of time, but once those plates were cleared, there was no sign of more food coming our way. After I noticed that the older couple who came in after us was leaving after eating a two-course meal, I managed to get the attention of a server and ask if our mains were ready. A couple of apologies later and our mains were delivered to our table. Our girl was getting tired at this point, so we finished our food and chose to return to the room to order dessert from the room service menu. After a good night of sleep, we woke up to driving wind and rain. Over a delicious breakfast in the hotel, we discussed our plans for the day. A walk was just not on the cards because of the weather, so we decided that we would check out and head north to drive the full loop of the lake making stops as and when we pleased. We soon set off to be encountered by puddles the size of ponds across the road in a couple of places. We had visions of more flooding as this rain was not letting up and chose to make the drive home instead. Our trip was cut short, but it was still nice for the three of us to get away and see a different part of the country. 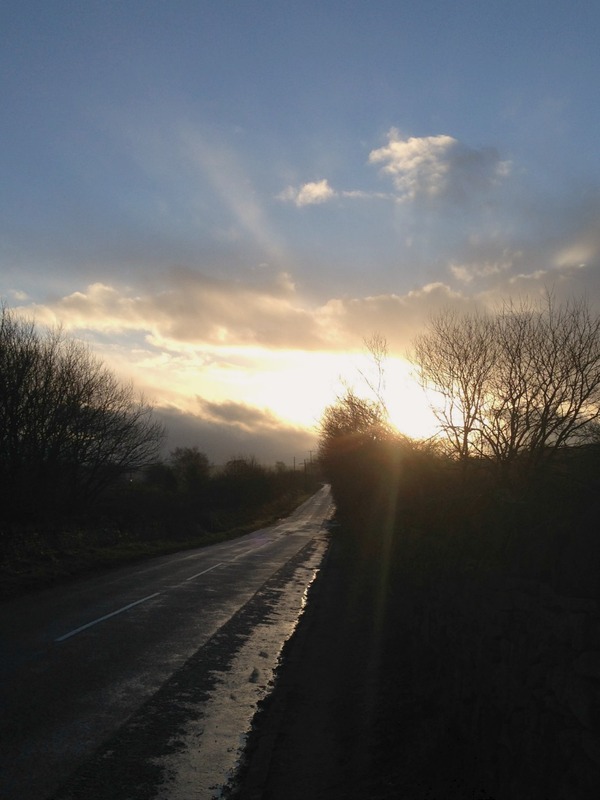 As we drove away, I found myself thinking about the chapter in Bill Bryson’s Notes from a Small Island. Not only did I have a good chuckle thinking about him walking into the residents’ lounge of the Old England Hotel to find it “casually strewn with ageing colonels and their wives,” but also about the conversation that followed when one of the said wives took it upon herself to discuss all of the shortcomings of America only once she realized that he hailed from the U.S.
And even after the area had experienced such extreme flooding, this statement hit me especially hard to witness this beautiful area thriving and recovering because of the people who love it so. Yep, it’s February, and I’m about to talk about Christmas. Lantern Magic was too good to not write about though! I had never been to Chester Zoo before, but Richard had taken our girl when I was in the States for a friend’s wedding over the summer. You don’t actually see any real animals during Lantern Magic as it takes place at dark yet I was still very much looking forward to seeing the large animal lanterns. We had pre-booked tickets months in advance, and as the day drew nearer, it was calling for rain. It did rain most of that day and a little bit whilst we were there, but it didn’t spoil the fun for us. We just layered up and wore raincoats. A certain little girl was particularly excited to be wearing her Peppa Pig wellies to splash through the mammoth puddles! When we arrived and entered the zoo, each child was given their own little lantern to carry around the path. (Our girl would not let go of hers and ended up holding it in the car seat for most of the drive home. It was quite cute!) Then, each family was given a large lantern to be used and returned. These lanterns were heavy as they were a bit wet, but the various colors added to the atmosphere of the night. Richard and I took turns carrying around our lantern. There was a path that everyone followed around the zoo in the same direction through various themed areas, such as an enchanted forest and a butterfly garden. Each area had its own lanterns that pertained to the theme. Our favorites (and I think this went for most people there) were the large animal lanterns. They were quite spectacular! A few of them were even animated by people, which was a unique touch. There was a giraffe whose head and neck was operated by a person to move in an extremely life-like manner. There were also two people wearing flamingo lanterns, who walked and carried out flamingo-esque mannerisms. We were very impressed! Around the path, there was at least one place to stop to purchase a snack and hot chocolate, but we chose to keep moving and head to the cafe at the entrance that was serving a few winter meal options for adults and kids. I would definitely recommend Lantern Magic as a fun and unique Christmas event. It was well organized and reasonably priced. 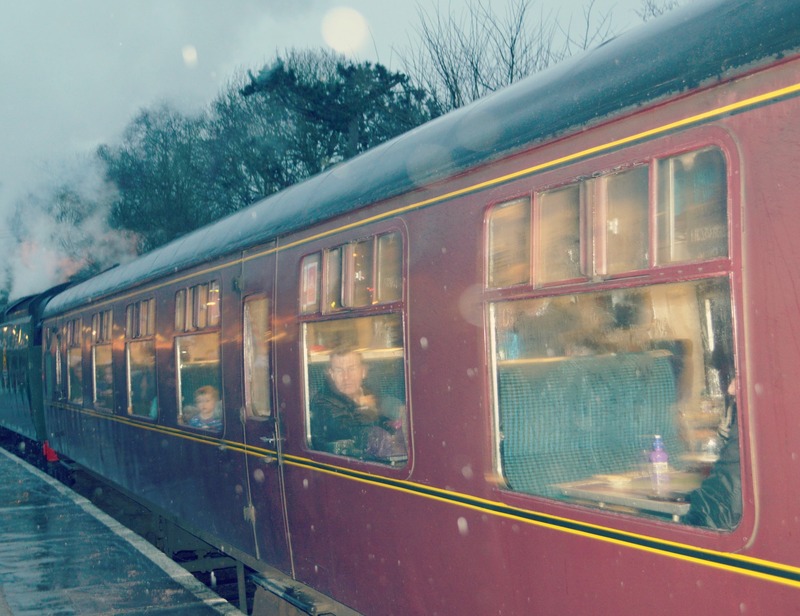 It has been added to our list of must-do’s for Christmases spent in the UK. 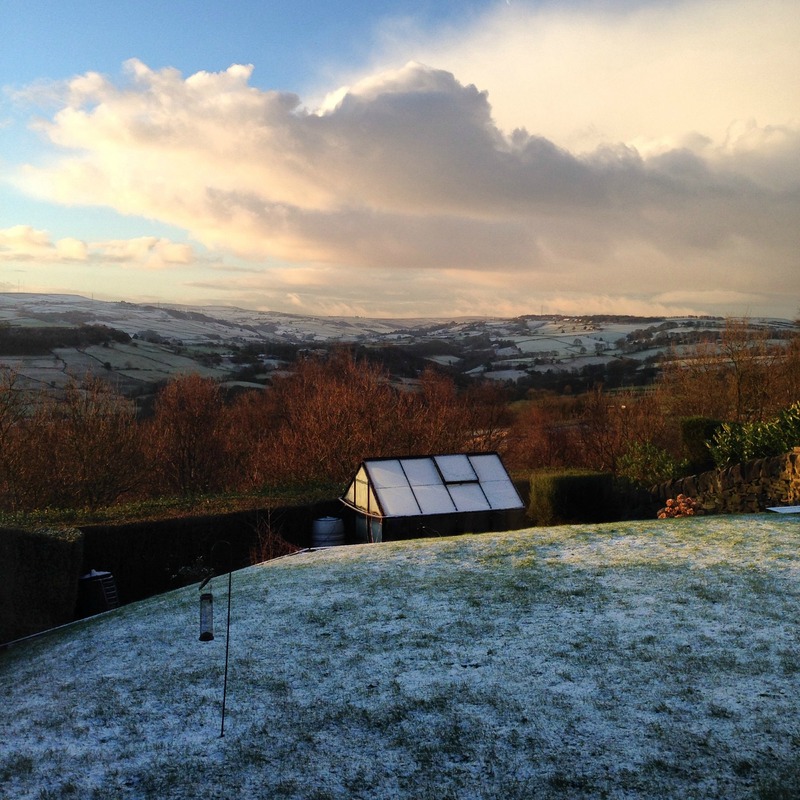 Next year, I’m hoping for a dusting of snow because the lanterns would look even more stunning on a bed of the white stuff! On the Tuesday morning of Adam and Kayla’s visit, I told them about a few places that we could visit and gave them the task of deciding what we would do that day while I was out getting my haircut. They checked the places out online, and when I came home about an hour later, they had planned the rest of the week for us! It was perfect, and I was so relieved because I put a lot of pressure on myself when visitors come as I want to be sure they have an amazing time. For Tuesday, they decided that we would go to the Yorkshire Sculpture Park as the weather was sunny and without a dark cloud in sight. (Can you guess where this is heading?) The park is about a 35- to 40-minute drive from our house, so when we got close and Adam and Kayla noticed how big the park is, they were surprised. Apparently, from the website, they had come to the conclusion that it was just a park in the center of a town with some sculptures in it, but they still wanted to check it out. 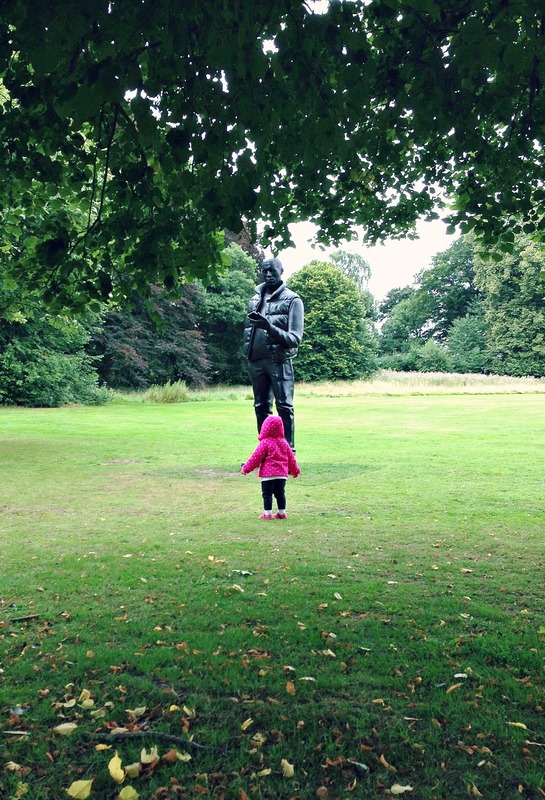 The Yorkshire Sculpture Park is actually a 500-acre country park, so they were very happily surprised to know this was where we would be spending the afternoon. We had a nice picnic lunch on the grounds near the YSP Centre before heading off to explore. We headed down to the Boat House and the Lower Lake first. 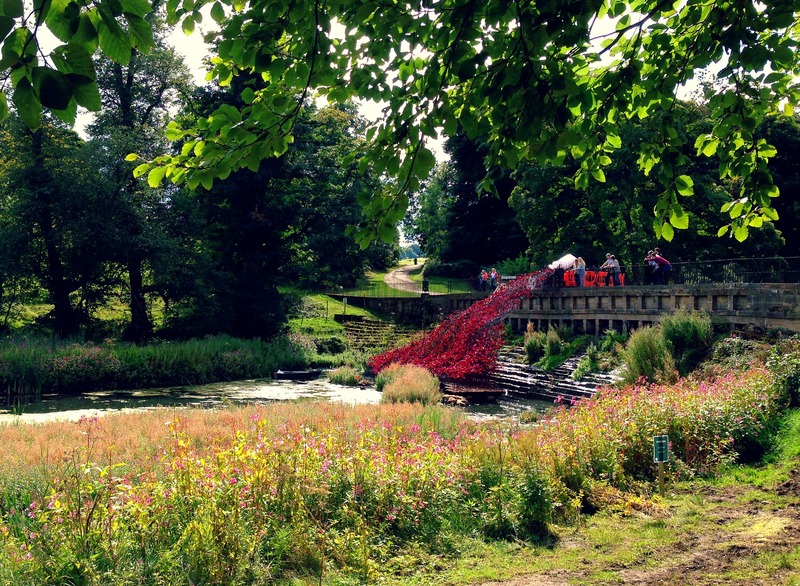 YSP is currently hosting the Wave, which was part of the poppies installation from the Blood Swept Lands and Seas of Red that was at the Tower of London. It was still being constructed when we were there, but we were still able to catch them installing it for its opening on 5th September. 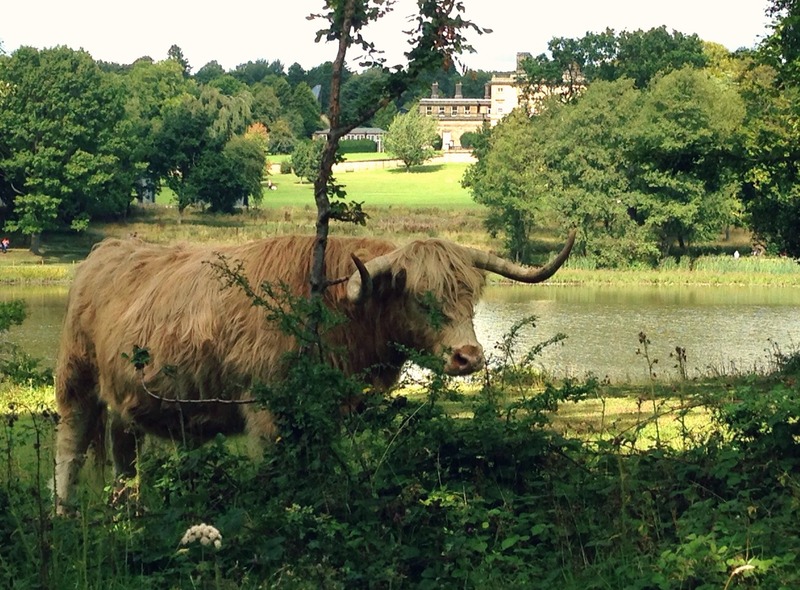 We crossed over the Cascade Bridge and risked our lives passing the Highland cattle grazing right in front of us. (Have you see the horns on those things?!) 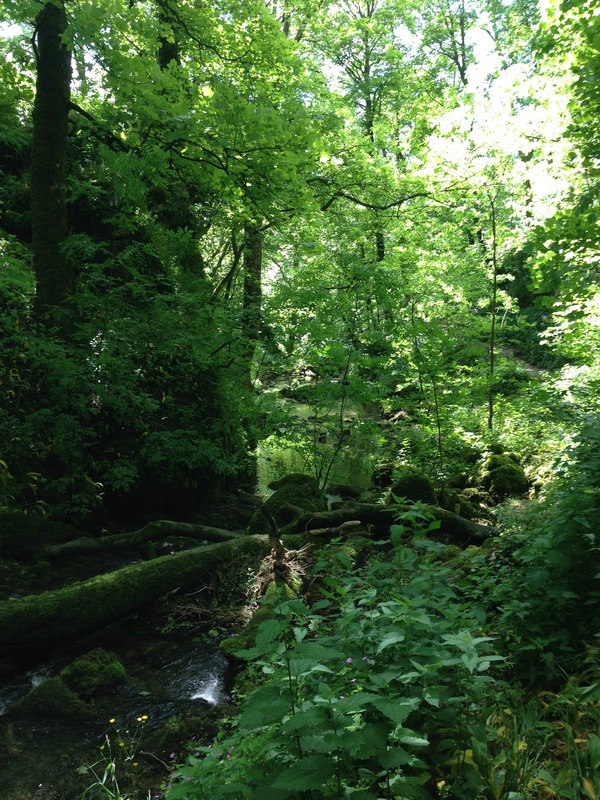 We followed the path through the woods until we reached Seventy-one Steps. It was at this point where I might have made a fatal error in continuing on. Because, unfortunately for me, but fortunately for my adventurous girl, we didn’t have the backpack/baby carrier with us as we had forgotten it in Richard’s car and he was at work. Adam and Kayla said they were going to carry on up the steps to the Longside Gallery, which is quite a distance if your daughter gets tired and needs to be carried. I debated about what we should do and finally decided to go along with them. Our girl made it up over half of the steps on her own before asking me to carry her. I was quite impressed! 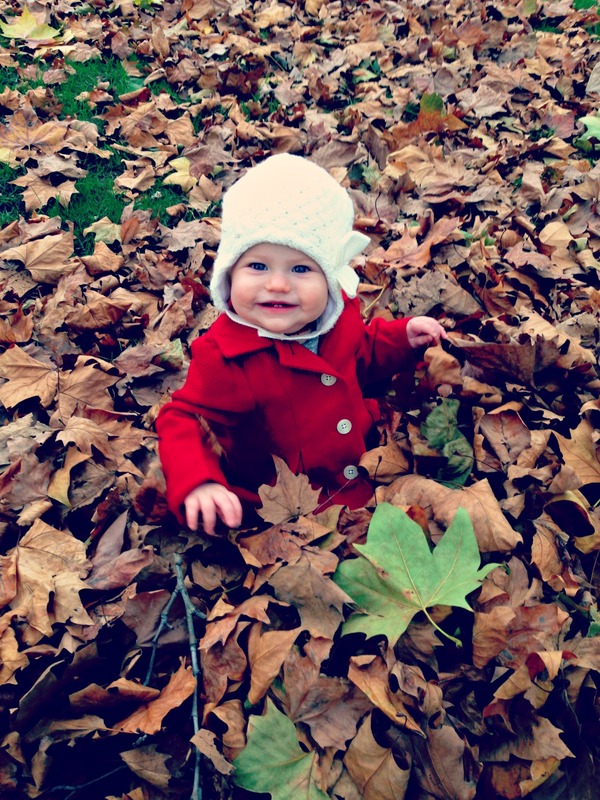 She then walked a bit then I carried her a bit then she walked a bit then…. Phew! During this ascent towards the Longside Gallery, we could see the sky becoming more black by the second. We were moving as quickly as we could with an inquisitive and independent toddler wanted to touch every tree and stick in sight. We did make it to the gallery for a bit of a break before we decided to risk the threat of rain and head back towards the car park. We were all tired and my arms felt as if they were about to fall off, but our girl was even more tired, so I ended up carrying her the whole way down across the Cascade Bridge. Shortly before arriving at the bridge, the rain arrived. Oh, did I mention we had one adult-sized raincoat between us?! Thankfully, the little ones were protected, but to avoid the rain as much as possible, we ran from tree to tree. Our girl didn’t mind the rain one bit and was venturing out whilst we huddled under the trees. This did make for some great photo opportunities and lots of laughing and smiling. Eventually, we ended up at Camellia House for a short time, so my little niece could have an afternoon snack of milk. I really enjoyed wandering around that space. It was a bit of a secret garden with sculptures hidden amongst the trees and foliage. It was a great little detour on our way to the car. 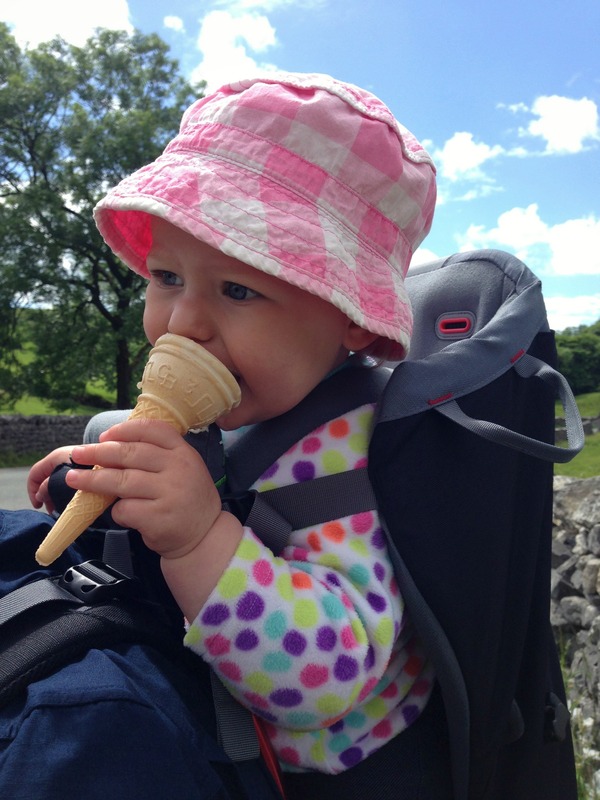 After a great day at Yorkshire Sculpture Park, we ended our day the way we ended pretty much every day that Adam and Kayla were here…with ice cream! We stopped at Charlotte’s Ice Cream Parlour in Whitley. We got the ice cream and ate it in the car. The ice cream was absolutely delicious, so I’d definitely recommend a quick stop there if you are in the area. It was another great, albeit exhausting, day with our wonderful visitors. 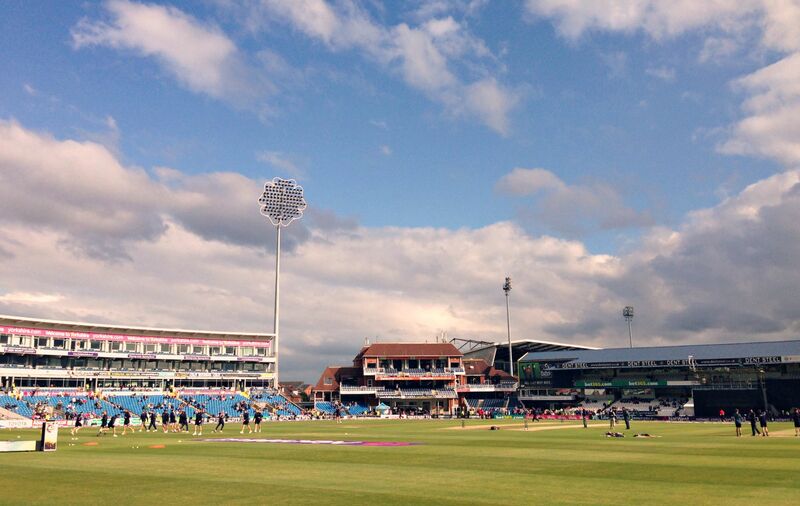 With my husband being an avid cricket fan, he mentioned to me in passing that Yorkshire would be playing Lancashire at Headingley Cricket Ground during the summer for the famous War of the Roses match. The game is called such because Yorkshire’s symbol is the white rose and Lancashire’s is the red rose. I did my research and saw that tickets went on sale at the beginning of February for the T20, so I set myself a reminder to purchase the tickets that morning in February for Richard’s birthday gift. He told me what stand he wanted to sit in and I did the rest. Flash forward to Friday the 5th of June and it was time for the cricket match. I had told Richard he could take one of the guys if he preferred, but he wanted me to go, which made me really happy because I’ve actually come to enjoy cricket over the past few years. Yes, some of the matches can go on for days (literally), but as I mentioned earlier, this match was a T20, which meant each team bowled 20 overs for a total of 120 balls (6 balls in an over). T20s are fast-paced because each club bats their heart out since they have a limited amount of time to get as many runs as possible. 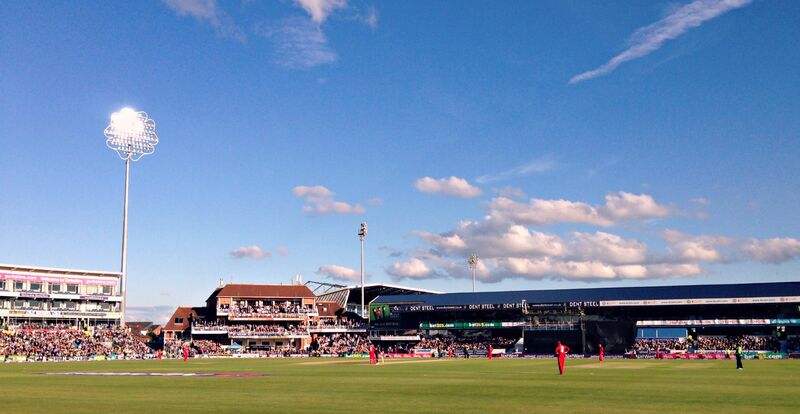 The atmosphere at these matches is brilliant with the fans being extremely enthusiastic about their home county. 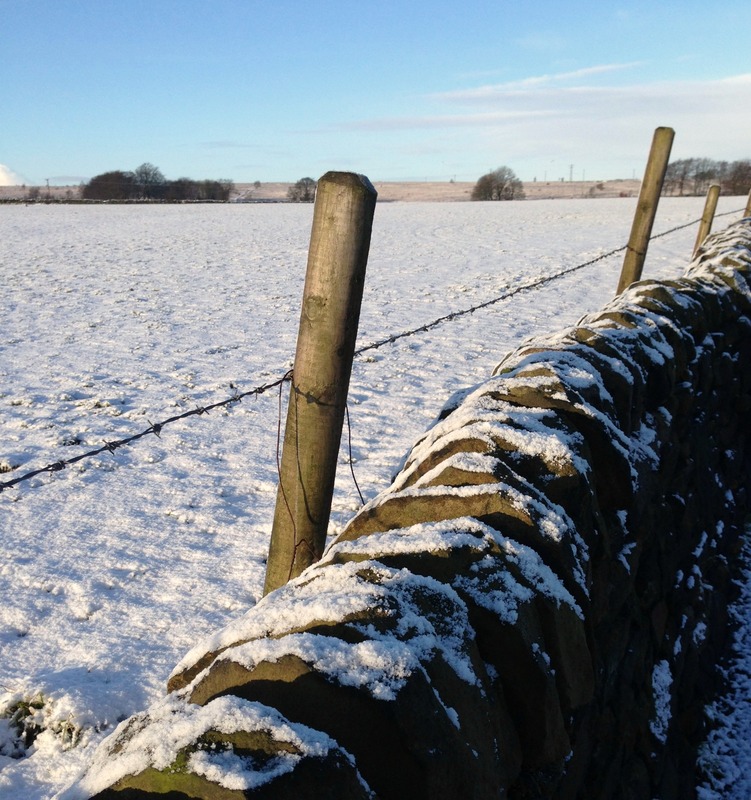 Any event which pits Yorkshire versus Lancashire is bound to be full of banter and shows the fairly intense rivalry between the neighbouring counties. We arrived about an hour prior to the start in order to grab a pint and some food at the grounds. It was already filling up and there was a buzz in the air, a lot of which was due to the extremely excited Yorkshireman that I am married to! He was filling me in on random facts and bits of information, and I was completely enjoying seeing him so excited. After finishing off our dinner of sausages and our first round of pints, we made our way to our seats. As we started to come down the stairs in our sections, I was convinced we were fairly high up, but Richard just kept walking down closer and closer to the cricket pitch until we realized that we were in the front row. At that moment, I believe I scored close to 1 million wife points! Richard’s face (okay, let’s be honest…mine too!) was plastered with a giant smile. Sitting in our seats, we were enjoying people watching when we heard an announcement stating that before the start of the match there would be a filming for one of our favorite shows, A League of Their Own. (Those of you in the U.S. may recognize the host of the show, James Corden, as the new host of The Late Late Show.) We were even more excited now to see some of the cast from the show playing cricket. It was quite hilarious to see these non-cricketers trying to bat. (Well, one of them is a cricketer, but he bowled at them…FAST.) We’re looking forward to when the episode runs next season. Soon after, the match started and my favorite Yorkshireman was in rare form as he cheered loudly for his county’s cricket team. One of the things I was looking forward to was hearing the chants from the fans. Many sports teams here have some epic chants, so Richard had said there would likely be some great ones at this match. We could not help but laugh though as the only chant coming from the Yorkshire fans was a very drawl “Yorkshire, Yorkshire, Yorkshire.” It was so blah and had no oomph to it, which was such a stark contrast to the energy of the match. 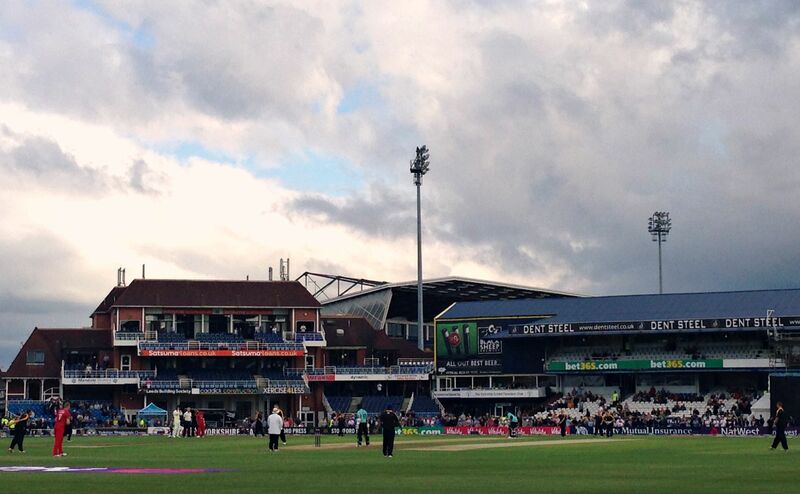 Although Yorkshire put themselves in a great position to win after batting first, Lancashire ended up winning by a few runs. The result was disappointing, but we still had an amazing time. 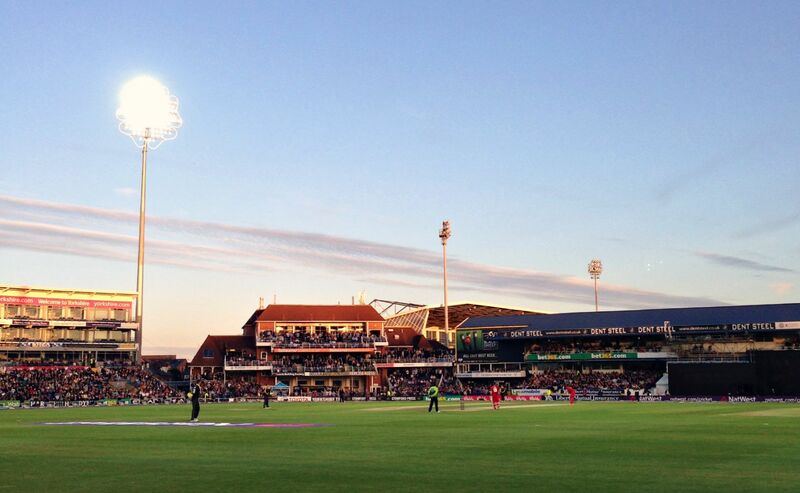 I completely enjoyed the experience and hopefully we’ll be able to catch another T20 next summer. I have always liked sports – not all, but most – and with cricket being such an iconic sport here in England, I’m happy that it is something I can enjoy watching with Richard. This past weekend was Richard’s birthday, so we decided to have a family day out since the weather was to be nice. 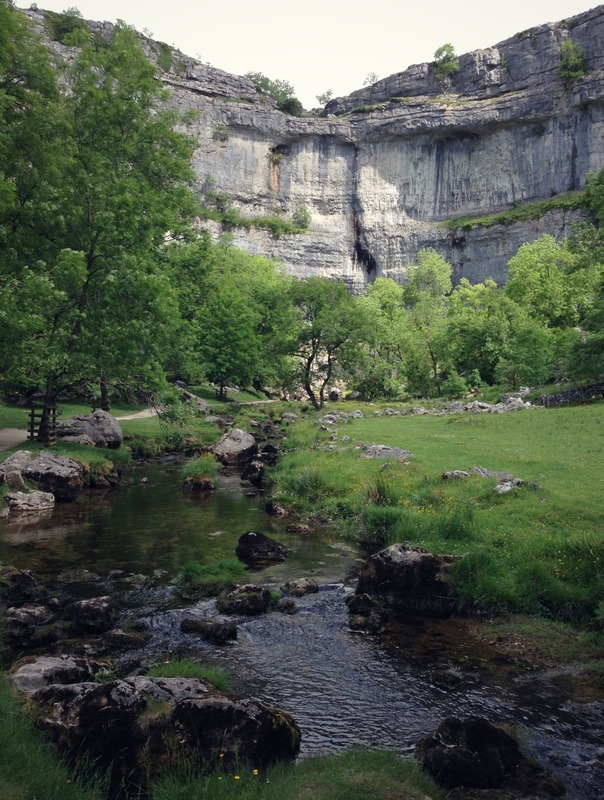 We brainstormed, and I did some Google searches when I stumbled upon a walk to a waterfall in Malham in the Yorkshire Dales. 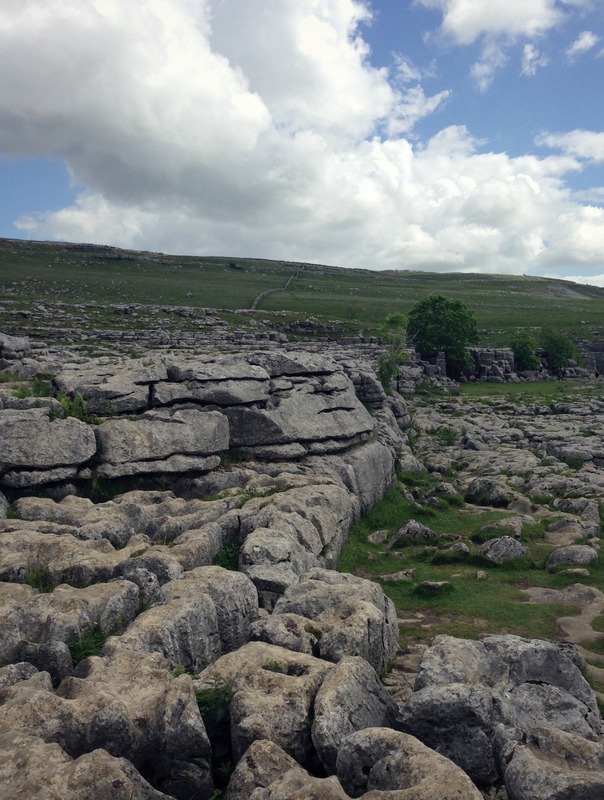 I mentioned it to Richard and he said, “I was going to suggest Malham!” He had been before on a school trip when he was 17 and I have never been, so we were both looking forward to a family hike and enjoying the sunshine. We set off on Saturday morning and decided to keep an eye out for a place that sells sandwiches that we could take on our hike for a picnic. 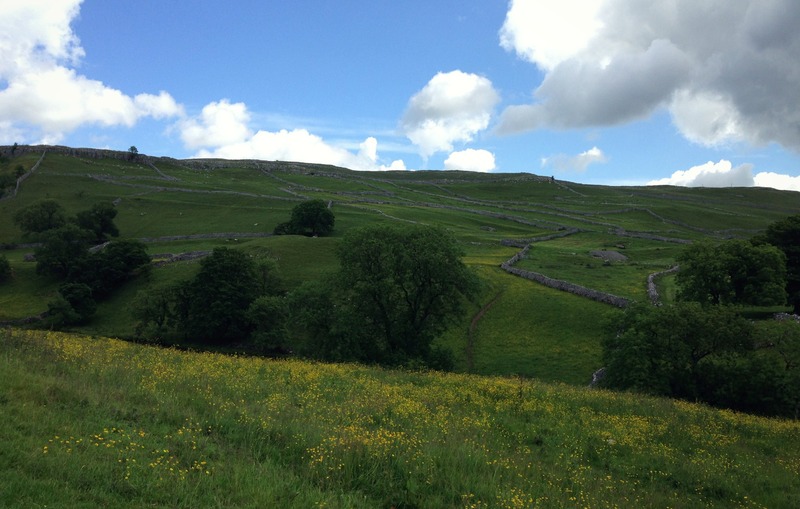 We were getting close to Malham when Richard spotted Town End Farm Shop, so we swung in and ordered some simple sandwiches to go. It was such a cute little place with a tea room that was packed to the brim with cyclists stopping for a quick refuel. The three of us shared some delicious homemade granola bars whilst we waited. 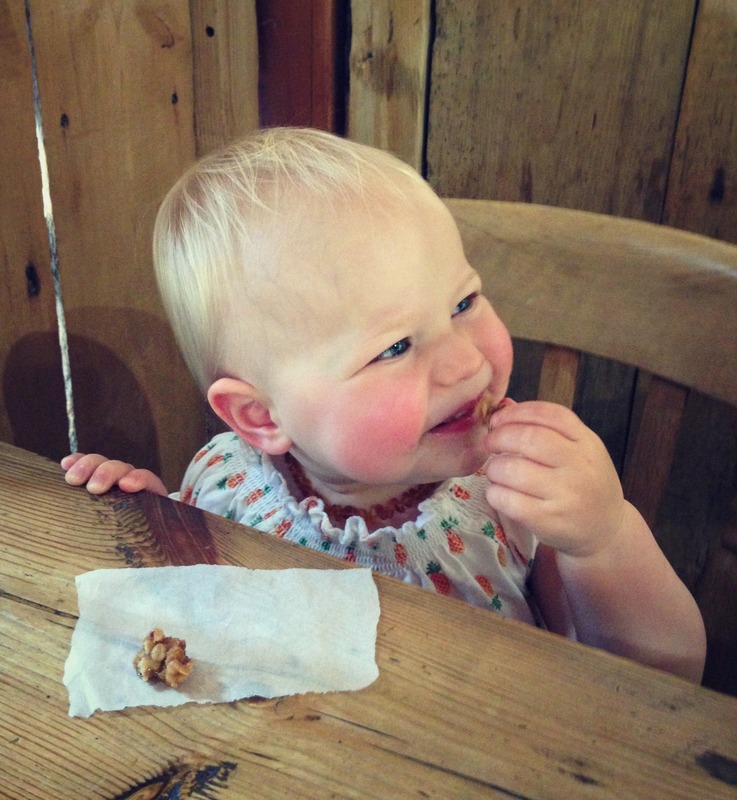 As you can tell from the photo below, our girl particularly enjoyed the one with walnuts with chocolate. Arriving in Malham we came across a line of cars already parked on the roadside, so we pulled in behind them. There is a sign stating that parking in the village is free however they ask for a £1 donation into the giant milk jug. We were happy to oblige for a prime parking spot. If there is no roadside parking available, there are a couple of car parks in the village although I’m unsure if they charge for parking. 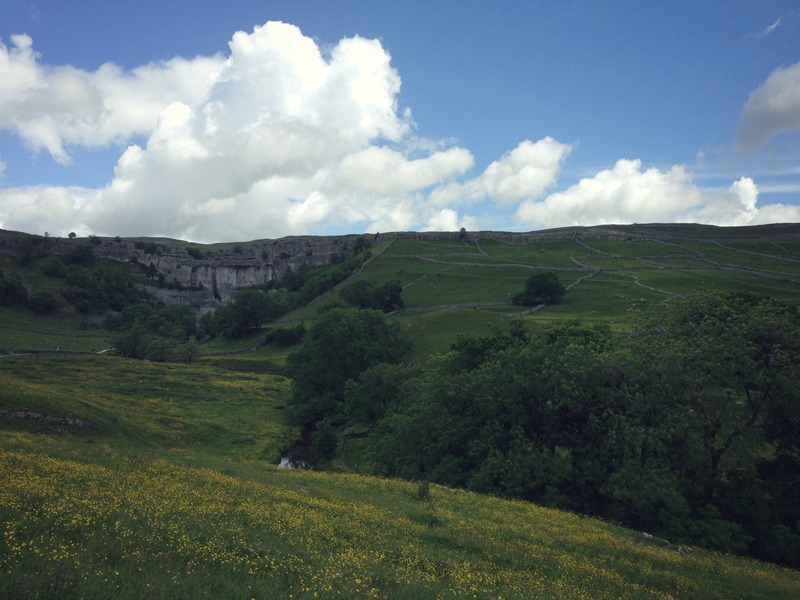 Whilst at the farm shop, Richard picked up a brochure with a few walks around Malham. 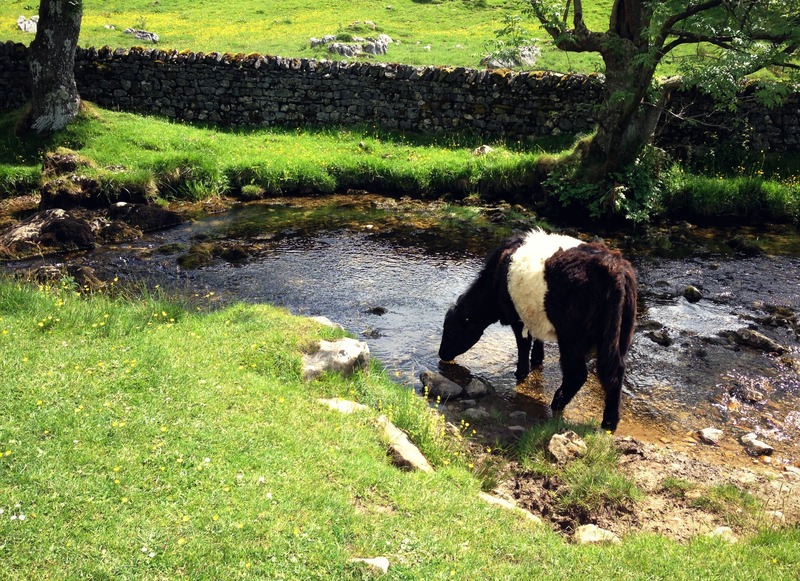 We found one that went to Malham Cove as well as Janet’s Foss, the waterfall that I had seen online. It was roughly 4.5 miles long, which was perfect for us. 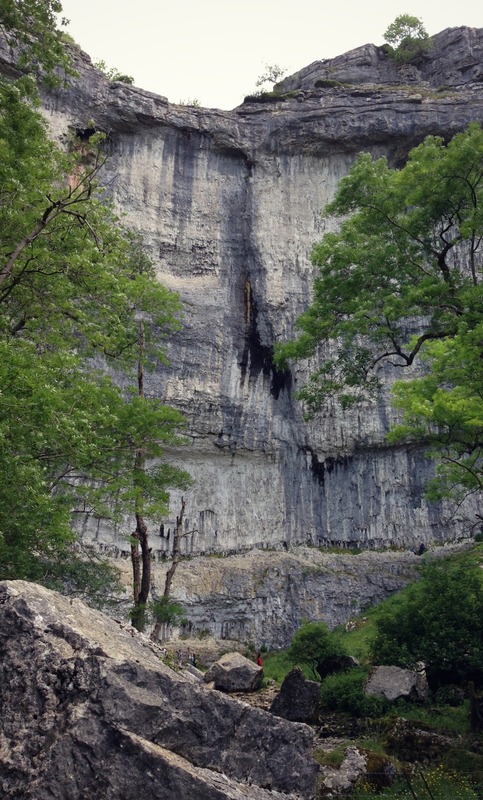 We set off toward Malham Cove and it’s quite an impressive limestone wall as you approach it. 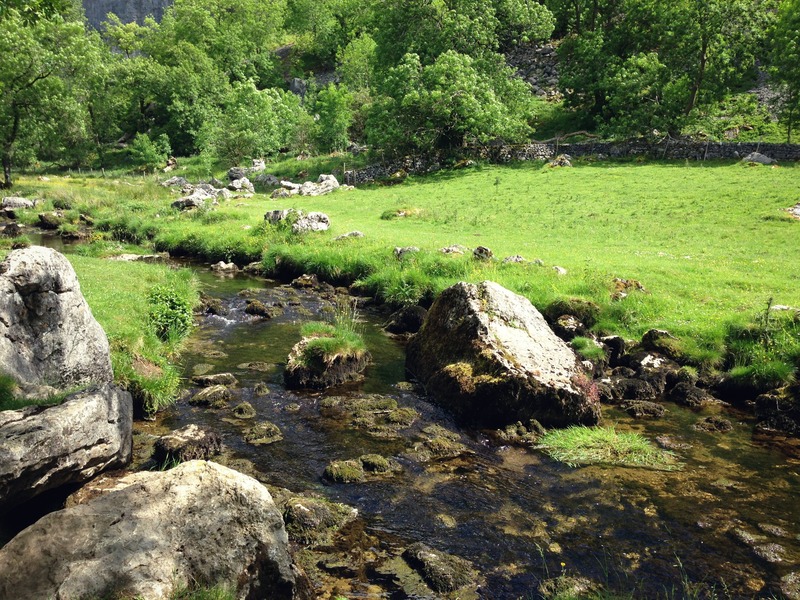 The cove along with the cows in the vibrant green field and the beautiful stream make it truly an idyllic site. The walk then took us up the hillside to the top of the cove into a field of limestone flags. 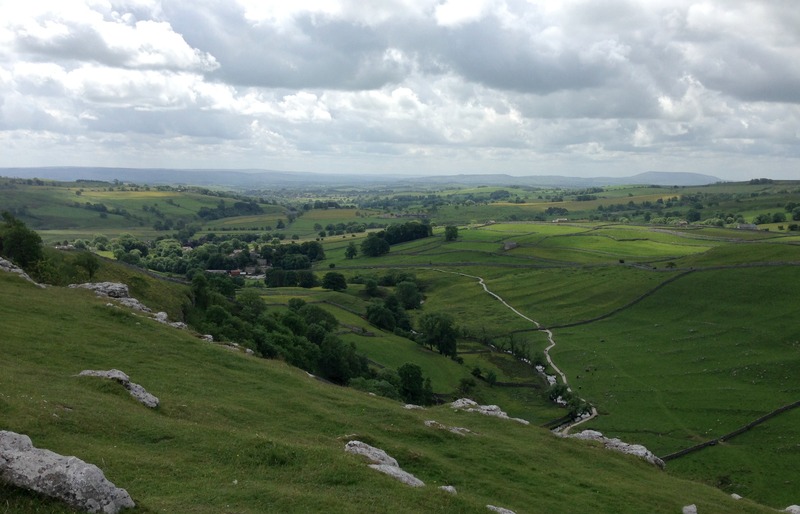 From there, we could see for miles – some of the best views in Yorkshire for sure! The directions on the map were a bit mysterious, so we ended up needing to backtrack a bit and managed to get back on course. It was all fine though as we were so enjoying the weather and being together. Our sweet girl is a connoisseur of animal noises at the moment, so the theme tune to our walk was compromised of her humming, moo-ing, and baa-ing. It kept us laughing and smiling the entire way! 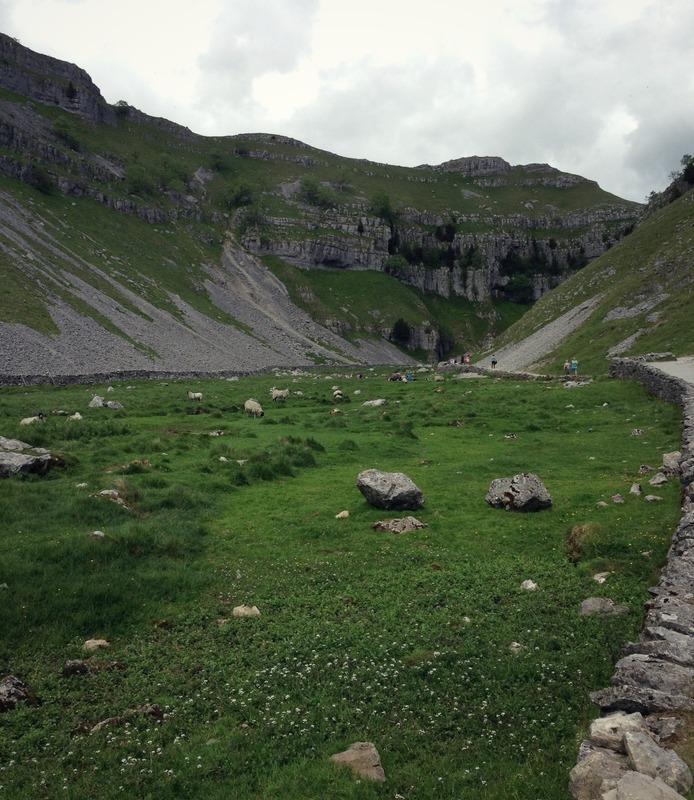 Once we got to the bottom near Gordale Scar, we grabbed a seat in the grass and enjoyed our sandwiches. They were the simplest sandwiches, but they tasted so good after all of that walking. Our girl finished her lunch and decided she would set off on her own adventure. We sat and watched her wander around as other walkers gave us little smiles when they spotted her enjoying her walk. I love that she brings joy to nearly everyone who sees her. 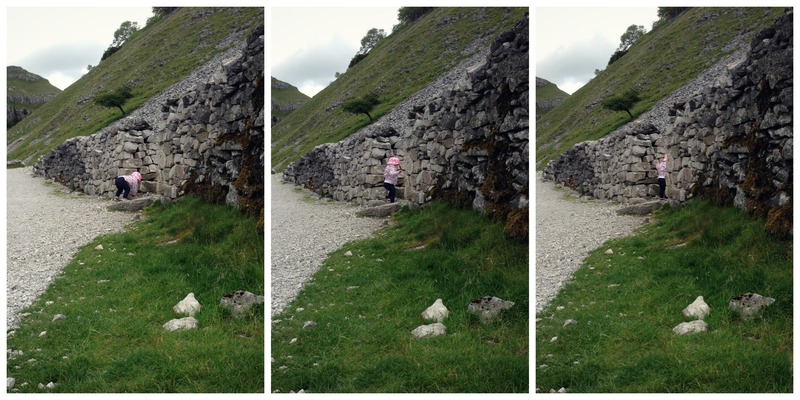 Once we rounded her up, we decided not to go further into Gordale Scar and instead turned around to grab ice creams from the refreshment van parked along the roadside. It was the perfect treat to continue the birthday celebrations of our favorite guy. 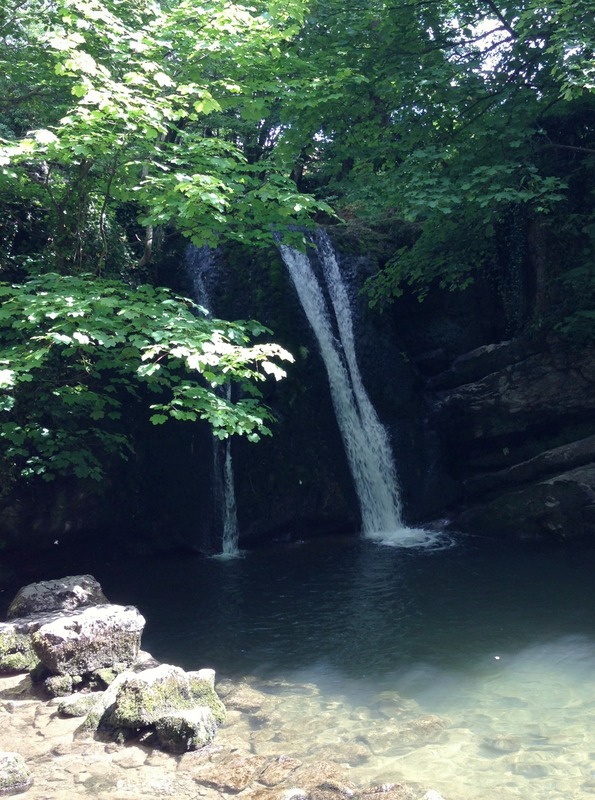 We then set off again in search of the waterfall, Janet’s Foss. I thought we still had a bit further to walk, but it was more or less across the road and through the trees! It was beautiful and there was quite a crowd gathered around the waterfall soaking up the day in the shade of the trees. We enjoyed the rest of the walk through the beautifully lush forest before it ended on a trail through some fields leading us back into the village. I’d love to go back and check out the village as well because it looks adorably quaint. 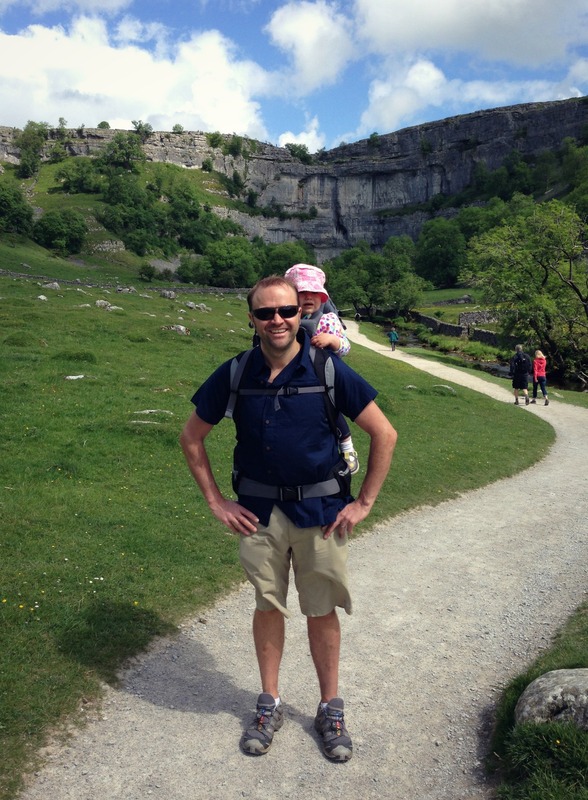 We really enjoyed our family day celebrating Richard’s birthday walking around Malham. I’d definitely recommend a visit to the area as it truly is stunning! 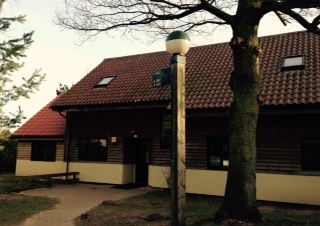 A few weekends ago, we went to CenterParcs in Nottingham with Richard’s side of the family. It was the third time in as many years that he and I have visited the lovely holiday resort. This time though, we stayed in one of the Exclusive Games Lodges, and it was amazing! It was the perfect size as there were 6 adults and 2 little ones in our group. It had four bedrooms all with en-suite bathrooms, a full kitchen, dining area, and a lounge with fireplace. The best parts though were the games room with pool table and giant beanbag chairs, the massive outdoor hot tub, the sauna, and the steam room. It was nice to have so much space and not have to tip toe around since the little babes were with us and went to bed early. As I mentioned in my first post about CenterParcs from 2012, you are only permitted to drive through the resort during check-in and check-out times, which makes it a great place for families. Kids can ride bikes and scooters on the road or you can push a pram without constantly dodging cars. We enjoyed a lot of walking during the weekend bundled up against the cold. 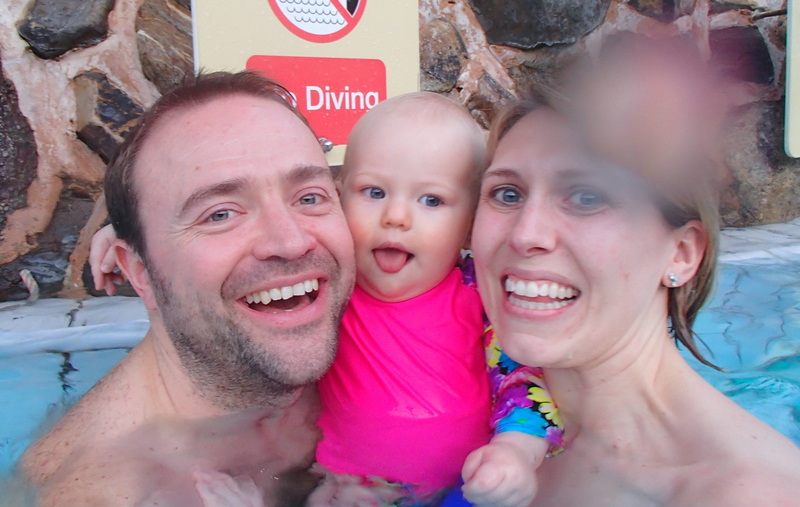 On the day we arrived, we went for a swim in the Subtropical Swimming Paradise. The swimming area is really great with the pool, rapids, water slides, kiddie pools, and hot tubs. If you plan to spend the day swimming, there is a cafe inside as well, so you don’t have to worry about leaving. It is a fabulous set up. We had a great time swimming with our girl. I take her swimming once a week, so I think she loved having her daddy there because she did not stop smiling and giggling the entire time. We spent most of our time in the big pool, but also checked out the kiddie pool. She kept trying to crawl in the water and had us cracking up because her legs would float not allowing her to get far at all. On Saturday, the three of us went for brunch at The Pancake House on the lake. I had a nice stack of American pancakes with a side of crispy bacon. Just like home! That heavy meal was followed by me taking a yoga class. It was nice to have a little bit of me time and get a nice stretch in during our weekend away. The afternoon was spent relaxing in the hot tub and hanging out around the lodge. That evening, all eight of us went for a meal together at Cafe Rouge. When we got back to the lodge, we played poker and Richard came out on top winning us a little pot of money! Sunday was also relaxed with a game of bowling and more swimming. We ended the evening with a walk to pick up some takeaway and enjoyed our pizza on the sofa watching television. It was the perfect finish to an enjoyable and relaxing weekend with family. 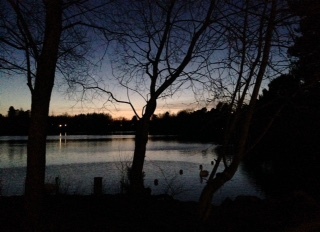 I really recommend CenterParcs to anyone. We’ve been with and without kids and had fun during all of our trips. It’s a nice place to getaway without having to go far from home. 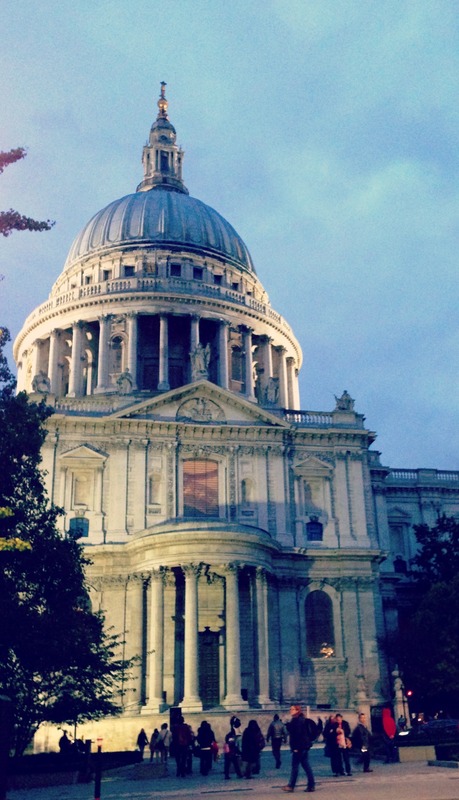 Definitely consider it as an option if you are looking for a weekend away within the UK! 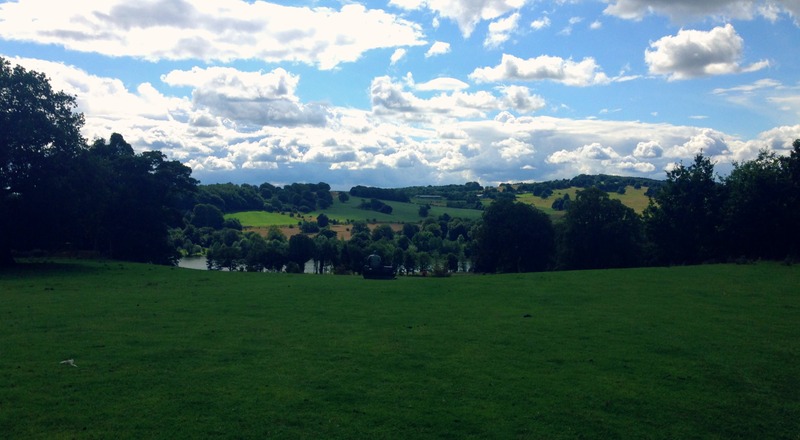 The landscape and the views that make up the English countryside are truly beautiful. 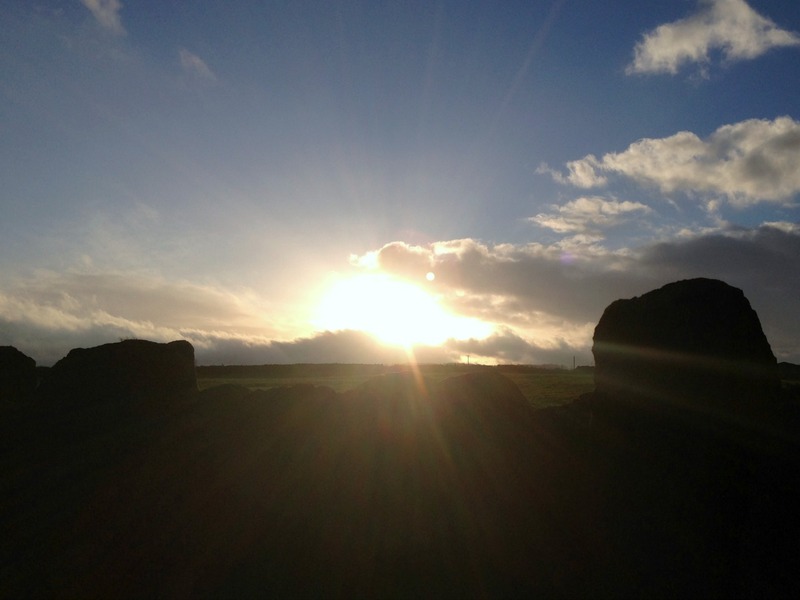 I’m partial to the Yorkshire countryside in particular and 2015 has brought some of Mother Nature’s best work to our area. 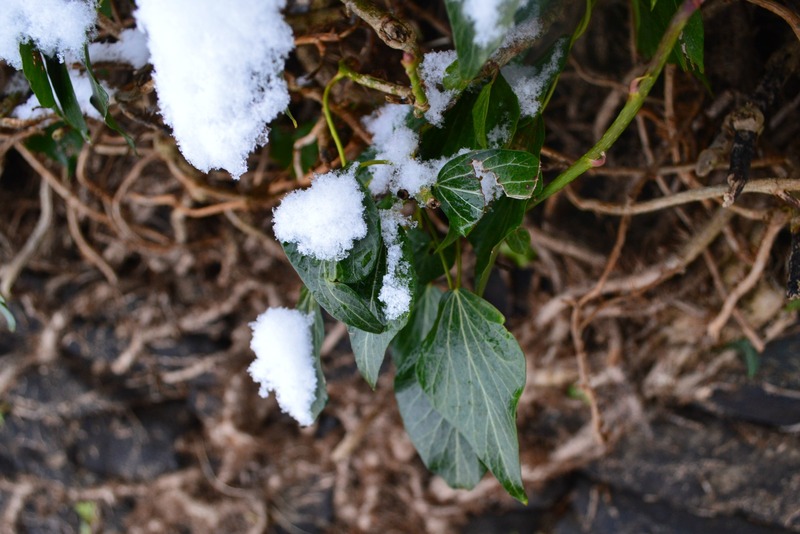 We’ve had all sorts of weather since the year began and that weather has left us with some gorgeous scenes that I wanted to share here. I hope you enjoy these photos! At first, when I saw the nearly £17 (roughly $25) ticket cost for adults, I thought we should maybe give it a miss. But, that is because I thought the 10-mile journey with stops in Keighley and Haworth would be on a train similar to the commuter trains with the TransPennine Express. Oh, how wrong I was! This gave Richard a good laugh and he set me straight by explaining that this was actually a proper old-fashioned steam train, I became extremely excited. Honestly, I could not wait for the 13th of December! 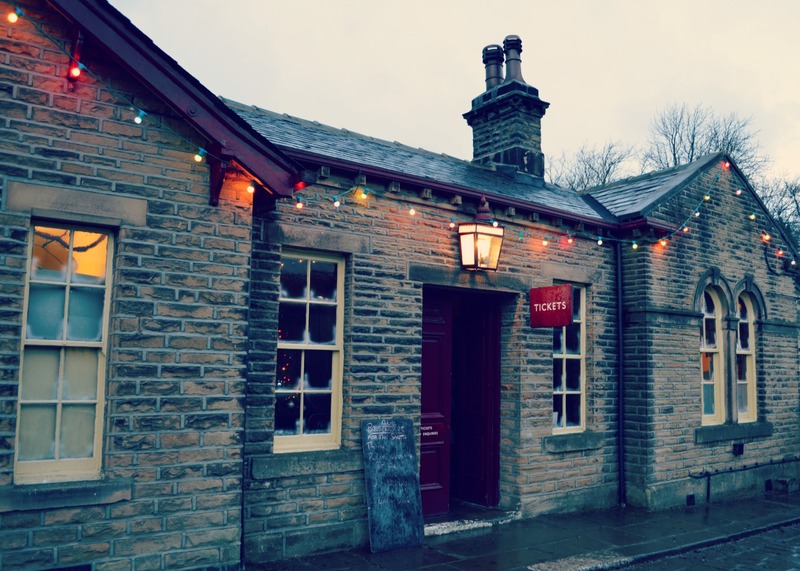 We arrived at Oxenhope station and it felt so Christmas-y — from the old-fashioned gas-lit lamps lining the platform to the ‘Winter Wonderland’ they had set up in the railway museum. Of course the moment we had to step outside to wait for the train, the rain started, so we kept the little lady covered as best we could and the rest of us anxiously awaited the train’s arrival with the hope of warmth once aboard. It was so neat to see the proper steam engine pull into the station (because of the rain I didn’t catch a clear photo of the engine), and it felt as if we had been transported back in time. We boarded our carriage and found our seats then were greeted by the jolliest woman who made sure we were comfortable and ready for a good time. I loved that the carriages had the original seats, upholstery, and luggage racks. Those details along with the Christmas decor really added to the festive nature of the train ride. Soon, we were on our way and prepped for what was to come – a visit from Rudolph, Scrooge, and Santa and his elves. 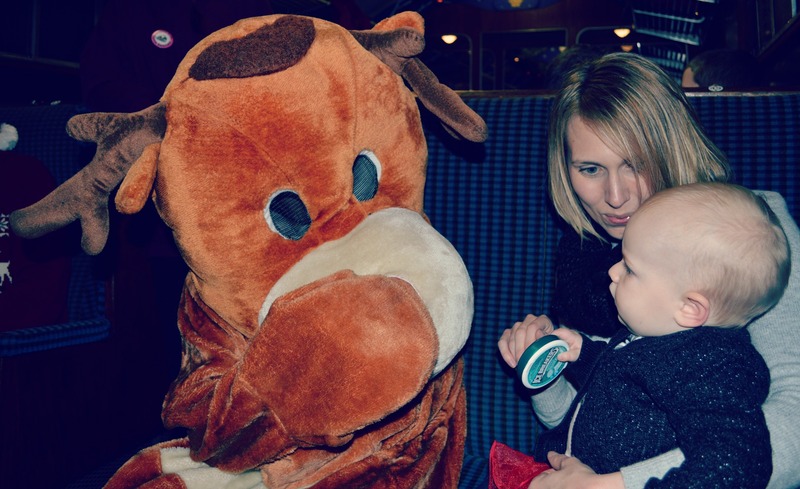 Well aware that we had a one-year old with us, the hostess on our carriage was kind enough to let us know there would be loud singing once Scrooge arrived as we needed to scare him off with our Christmas cheer in the form of Christmas carols. We would quite certain it wouldn’t bother our girl, but it was nice of her to forewarn us just in case. As we suspected, she was completely fine with the additional noise plus she loves music, so I think she enjoyed watching us sing along. I can’t remember at exactly what point they came through the carriages with mince pies and sherry for the adults, but that was a big hit with our parents…particularly our mothers who seemed to let that sherry go right to their heads! Hilarious. Our little lady surprisingly loved the mince pie. They do have a very specific (and almost spicy) taste to them, but she finished one on her own! Soon enough, Santa came through the carriage with an entourage of elves. 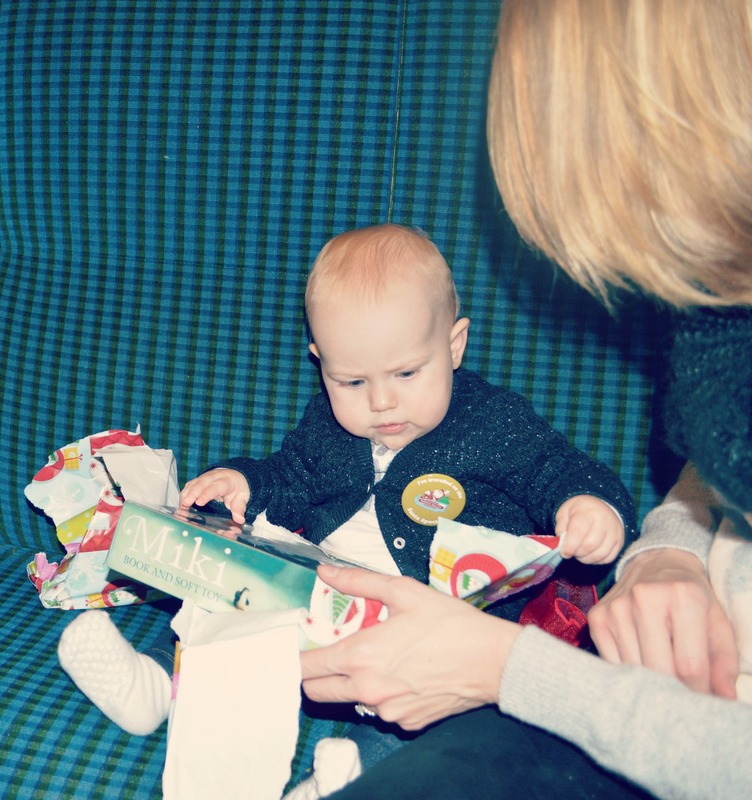 It was a pretty impressive operation to ensure that each child received a gift appropriate to their age. 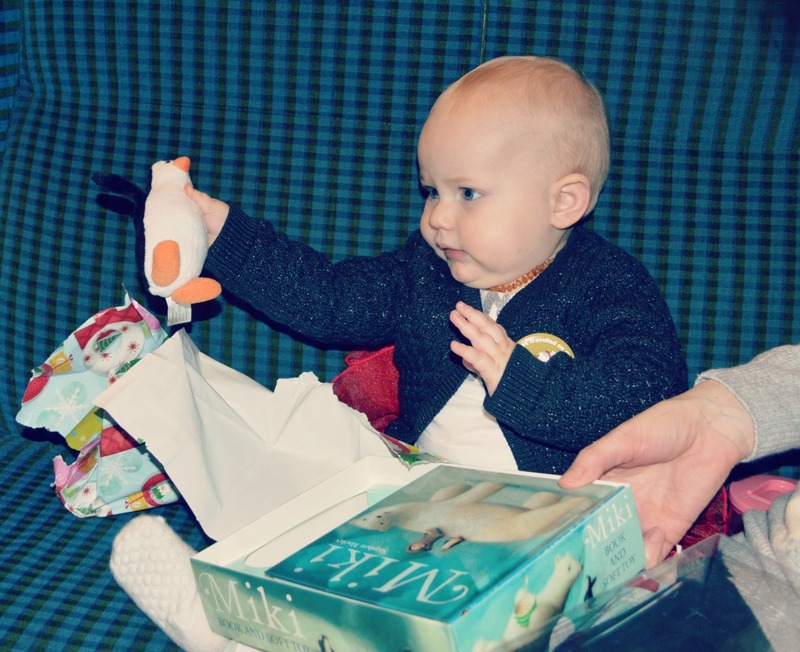 Our girl got a great gift set that came with a book about an eskimo and a stuffed penguin like the one in the book. She LOVED the penguin! 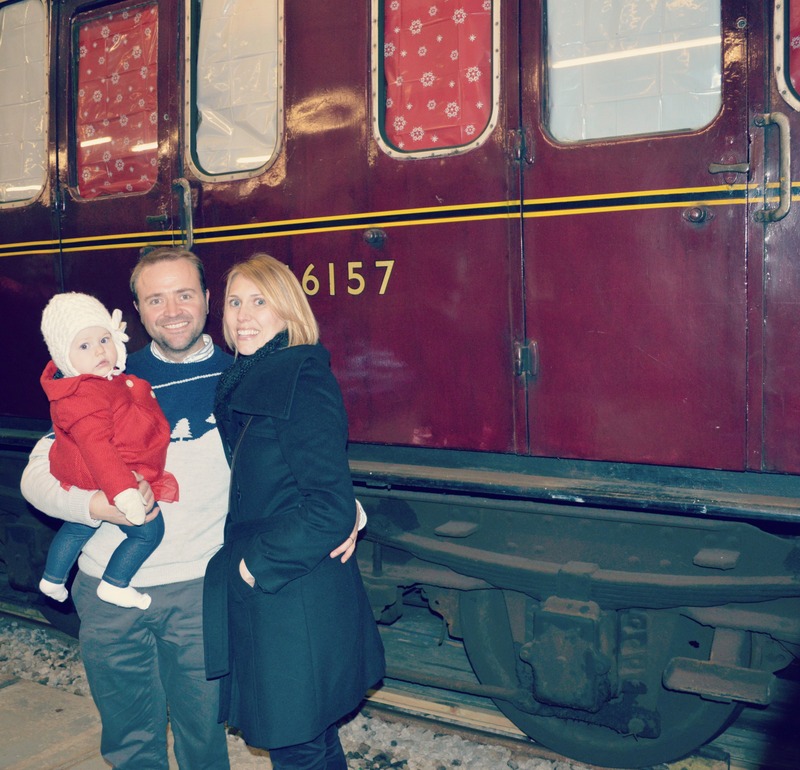 We were so happy with the entire train journey and our sweet girl seemed to enjoy it, especially the food part of it! 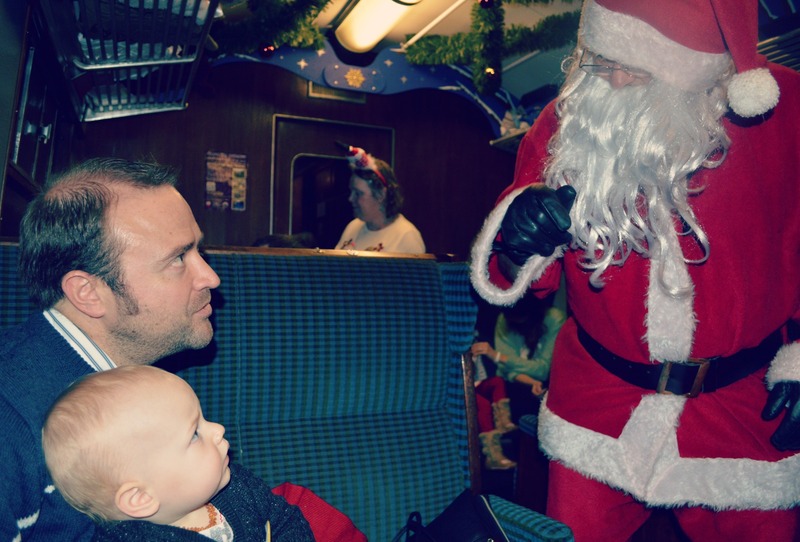 We’re definitely planning to make this an annual tradition and look forward to making more memories on the Santa Special steam train in years to come! Last year, during the last weekend in October, Richard and I went to London for our last getaway before our baby was due. This year, unknowingly, we booked the same weekend for the three of us to travel down south for a couple of days in our favorite city. In 2013, we had no idea what we were in for with a baby on the way, but I do know we hoped she would be an easy traveler and that she would just go with the flow. So far, she has proved to be an awesome addition to our travels – both near and far! 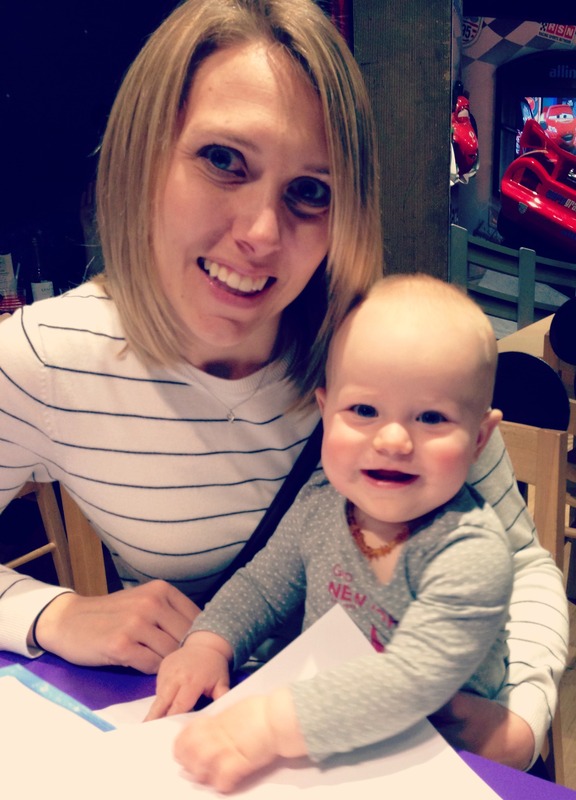 We had no real plans for our time in London aside from taking her to Hamley’s and Harrods to check out the toys. She is extremely curious about everything around her, so we were both excited to see how she would react to these two places full of sensory overload. If we had to do it again, we would skip Hamley’s. It was just too crowded. Harrods toy department, on the other hand, was really enjoyable and just the right amount of hectic. It probably also helped that we got there just as it opened on Sunday, so we avoided a lot of the normal tourist onslaught. Our little lady loved looking around at everything there was to see, and we loved gawking at some of the crazy (expensive) gifts on offer. We actually found her Christmas gift there, which we think she will really enjoy. After we left the toy shop, we wandered around the children’s clothing department and happened to notice The Disney Café. It was lunch time, so we thought we would give it a go. We really enjoyed it! The food was top notch, which we had expected from a restaurant in Harrods. The girl had a ham and cheese toastie cut into the shape of Mickey Mouse, Richard had a savoury crepe, and I had the mini cheeseburgers (and I was pleasantly surprised when the server asked how I would like them to be cooked). And, imagine my surprise when Richard ordered us a bottle of wine! It was such a nice lunch, and we loved watching our girl (wearing Minnie Mouse ears!) chomp away at her toastie whilst looking around at all of the older kids. She was in her element for sure! 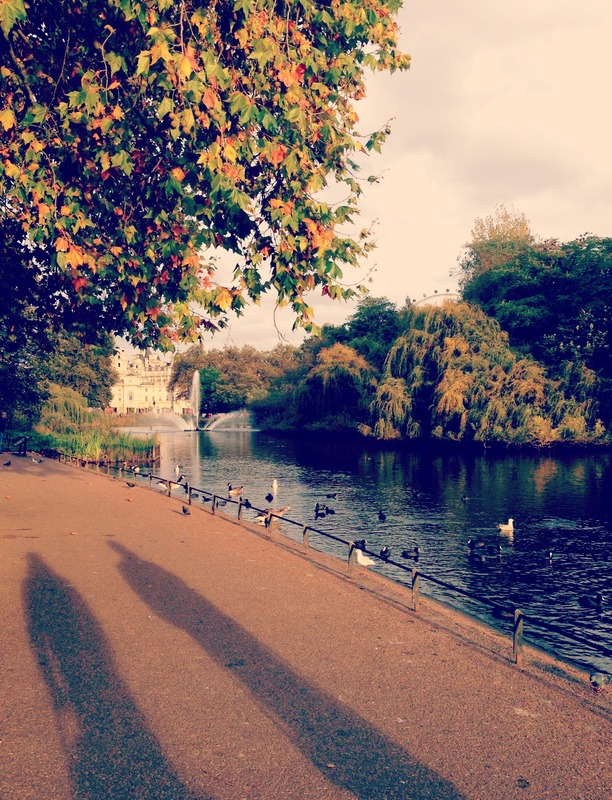 After leaving Harrods we walked towards Hyde Park Corner to Buckingham Palace and on to St James’s Park. We stopped in St James’s Park because it was time for the girl to be fed. (Yes, she had just eaten, but sister needed her milk!) I plopped down to feed her underneath some fabulous towering trees. 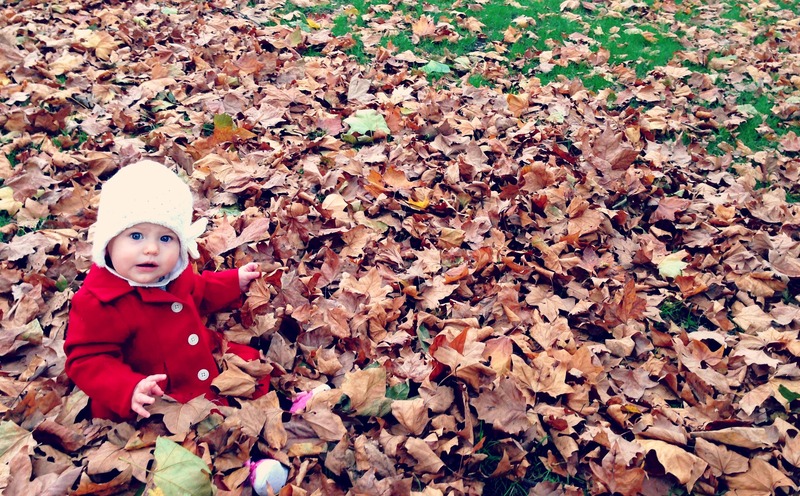 When she finished I sat her next to me in the leaves and she was amazed by them. She examined them and played for awhile, and it was fun to just see her taking in the textures and the colors of the leaves. 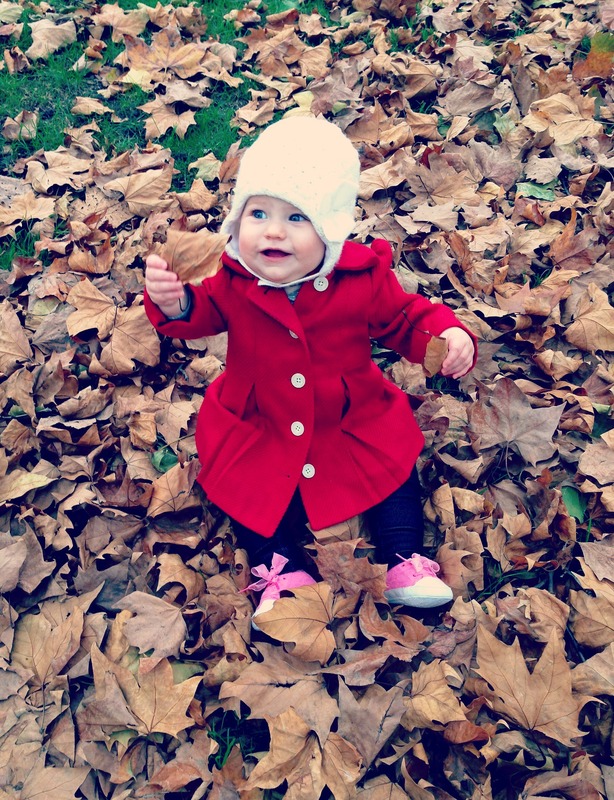 Richard would pick up bunches of leaves and throw them up in the air, which absolutely amused her! 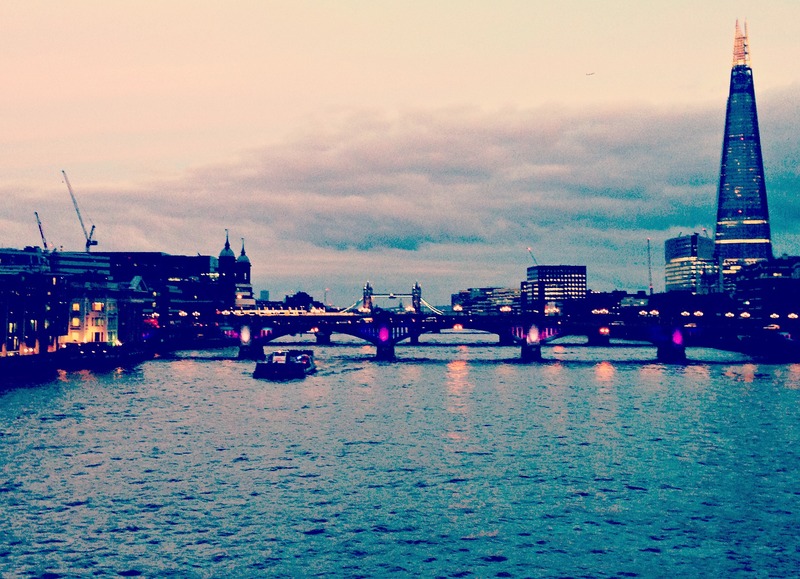 After leaving the park, we headed to Westminster and crossed the Thames at Westminster Bridge to the Southbank. 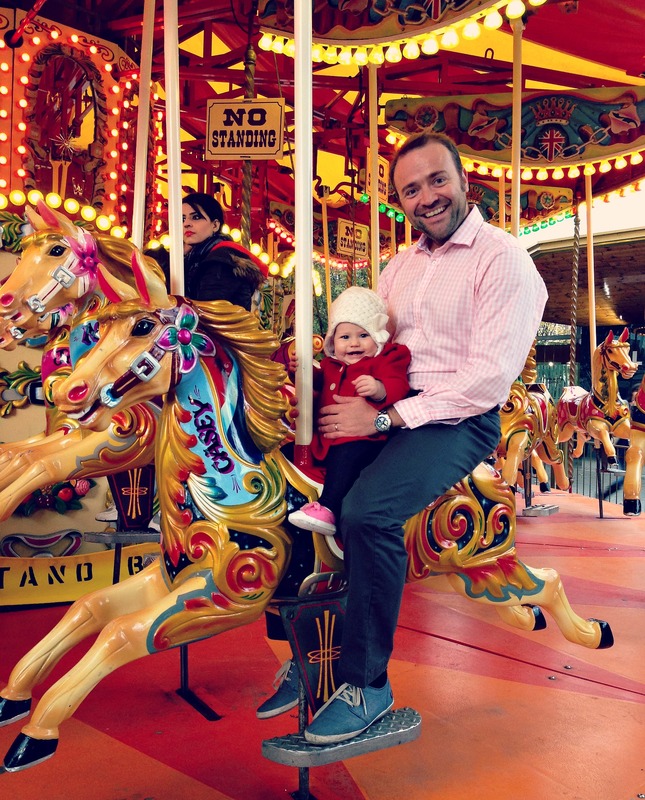 There is a carousel on the Southbank, so Richard took the girl for a ride. She was unsure when they first sat down on the horse, but after a thorough inspection, she smiled big whilst pointing directly at me stood along the side. (Someone had to look after the pram and our shopping!) She seemed to absolutely love the ride, and Richard laughed the entire way around. And me? I could not stop smiling! I love those unexpected moments that we share when we are all together. After the carousel ride, we decided it was time to call it a day (plus we had to get back to watch the Strictly Come Dancing results), so we set off walking back to Islington. Once we were near the hotel, I happened to spot an advertisement for Chipotle, and it was all I could think about since it has been ages since I’ve had anything remotely resembling decent Mexican food. We located said restaurant and grabbed takeaway to enjoy in the comforts of our hotel room. The day ended with us plopped on the bed in comfy clothes chowing down on delicious burritos and chips and salsa. That weekend was made up of so many little moments that were completely unplanned. 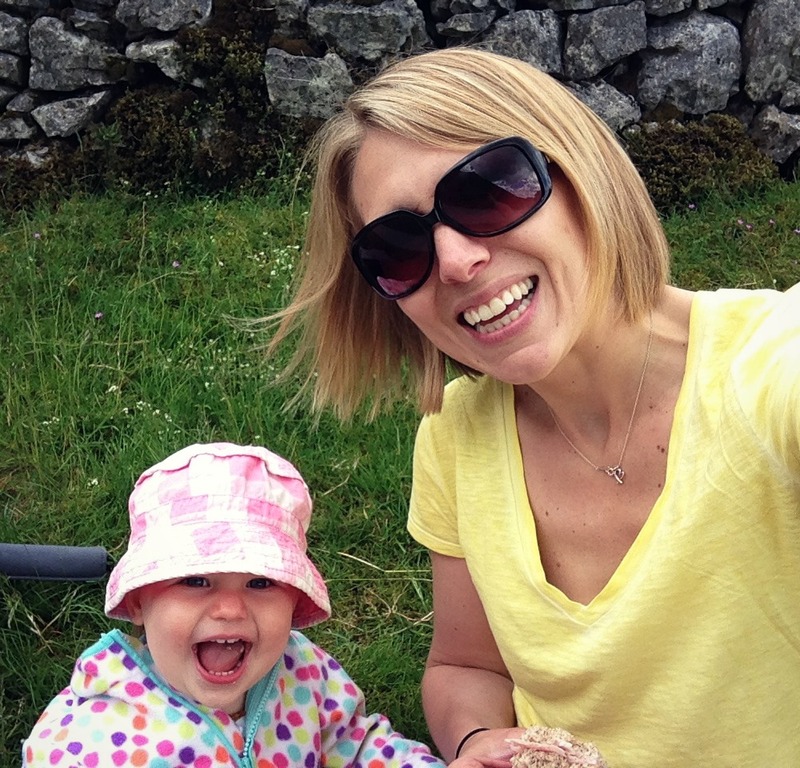 We smiled a lot and laughed hard and introduced our daughter to a number of new places and experiences. I don’t think either of us could have anticipated how much joy we would get from observing our daughter absorb the world around her. It was great to slow down and really watch her take everything in. 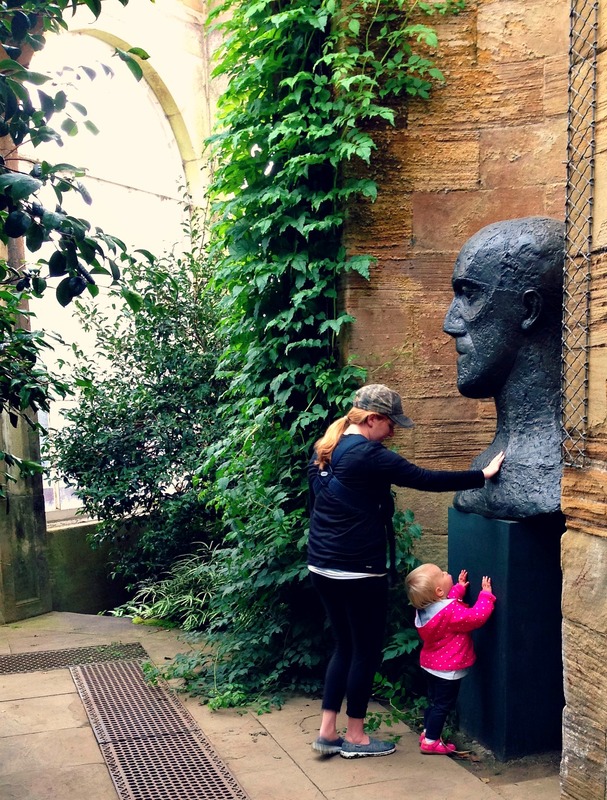 This trip allowed us to look back on where we were a year ago – full of wonder about what our daughter would be like and what we would be like as parents – and realize that we are living our life as a family of three in the best way that we know how. And, in my mind, that is a great way to be.